It was a great week for Bosham but one to forget for Sidlesham in the latest round of SCFL division-two games. Bosham put on a clinical second-half show to see off Clymping and avenge the loss on the road earlier in the season. Max Smith and Matthew Andrews both scored on their debuts for the Reds as the game turned into a classic tale of two halves. Both sides were edgy from the start and neither could muster a worthy effort, leaving the healthy-sized crowd frustrated. Tom Foxon was a threat for the visitors having been the Robins’ scourge in the reverse fixture. Clymping almost grabbed a shock lead in first-half injury time but keeper Kieran Magee made a good save to deny Foxon and was able to breathe a sigh of relief when Nick Precious ballooned the rebound over the bar from yards out. The second half was only a few minutes old when the deadlock was broken as a resurgent Bosham flew out of the blocks. Callum Coker thumped a header on to the bar, with keeper Joel Grout well beaten, and Jake Lafferty was in the right position to nod the rebound back into the net. Minutes later Coker doubled the lead for the Reds with another sublime strike. This time Matt Docherty placed a superb ball over the top and Coker hit a first-time effort on the turn past the outstretched hand of Grout and into the bottom corner. Soon Lafferty made it 3-0 for the hosts with a looping header into the top corner, making it three in seven minutes to settle any nerves and leave the visitors shellshocked. Jamie Wilkinson and Andrews came off the bench to make their much-anticipated debuts but it was another debutant in Smith who added a fourth not long after the hour. He bullied his way through a beleaguered defence and fired low into the net. Next the ever-popular Grant Radmore got on the scoresheet when his corner flew straight into the net, leaving Grout stranded and Bosham fans rejoicing. The last word went to Andrews, who showed class and quality to come up with a typical striker’s finish to make it six of the best for the Robins and close the gap to five points to leaders Rustington. An away trip to Roffey this week will be another tough test of Bosham’s credentials. Next Tuesday sees Bosham take on Cowfield at Steyning in their Division 2 Cup semi-final. Bosham: Magee, Barnes, Docherty, Dowden, Bell, James, M Smith, Miles, Lafferty, Coker, Radmore. Subs: A Smith, Wilkinson, Andrews, Probee. Promotion rivals Alfold were more than a match for the home side, whose lacklustre performance allowed the visitors to take the three points. With games coming thick and fast for Sidlesham now they cannot afford anymore slip-ups if they are to finish among the frontrunners in the league. 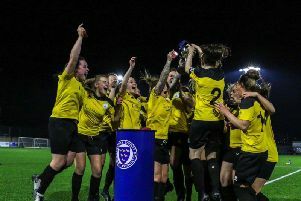 With a semi-final awaiting them next week, they put Saturday’s disappointment behind them quickly by winning 3-0 at Clymping on Wednesday night. Alfold were the better side on the day and Sidlesham will need to improve on Saturday if they are to achieve anything this season. They entertain fourth-placed Westfield on Saturday (3pm). Next Thursday they face Rustington at Pagham in the semi-final of the Division Two Cup.